The Special Presidential Investigation Panel For Recovery of Public Property has provided reasons it arrested the governorship candidate of the All Progressives Congress, APC, Senator Hope Uzodinma, on Sunday. Okoi Obono-Obla, Chairman of the panel, said the lawmaker, who represents Imo West at the National Assembly, was arrested at the Nnamdi Azikiwe International Airport. He disclosed that the panel was investigating the lawmaker over his company’s failure to execute contract of $12 million for the dredging of Calabar channel awarded by Nigerian Port Authority, NPA. “This evening, at about 8.20pm, operatives of the Special Presidential Investigation Panel For Recovery of Public Property at the Nnamdi Azikiwe International Airport arrested the APC governorship candidate in Imo State, Hope Uzodinma. 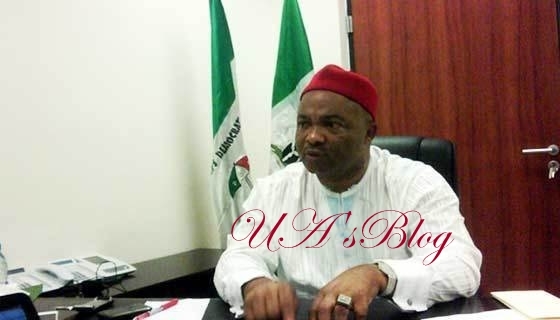 “The panel is investigating economic sabotage against Senator Uzodinma arising out of the failure of his company to execute a contract of $12m for the dredging of Calabar channel awarded by the NPA,” Obono-Obla, said in a brief statement.